The story revolves around Maxi dela Cerna, a young, aspiring New York-based fashion designer who returns to the Philippines shortly after her mother’s death to find her father. She had been swindled by her ex-boyfriend and hopes to pay off her debts by selling the piece of provincial land that her parents co-owned. But this means spending time with her father whom she hates for walking out on her and her mother 15 years ago. As the uptight and guarded Maxi struggles to immerse herself in farm life and deal with a father she despises, she crosses paths again with Tommy, her childhood friend, now an architect who is trying to heal from his own mistakes in the past with his 7-year-old son. 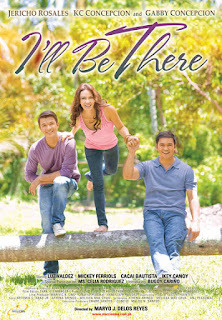 I'll Be There is a 2010 Filipino drama film starring Gabby Concepcion with daughter, KC Concepcion and Jericho Rosales. It is Star Cinema's offering for Father's Day. The film premiered nationwide on June 16, 2010. The film had international screenings in select cities in the United States such as San Francisco, CA, Milpitas, CA, Cerritos, CA, Ontario, CA, San Diego, CA, Seattle, WA, Honolulu, HI, Las Vegas, NV, and Bergenfield, NJ.